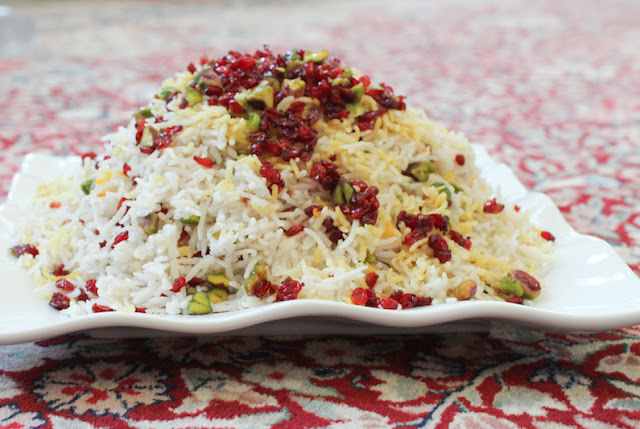 Elevate rice from plain to a bejeweled side dish with golden saffron, crimson barberries and bright green pistachios. 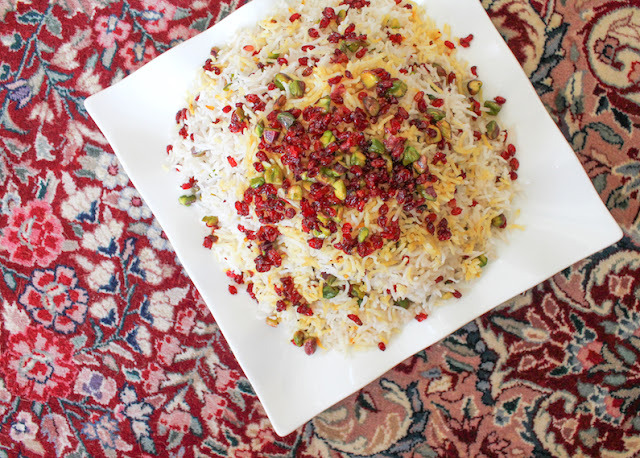 Barberry Pistachio Saffron Rice is as pretty as it is tasty. If you have a rice cooker, it’s super simple as well. 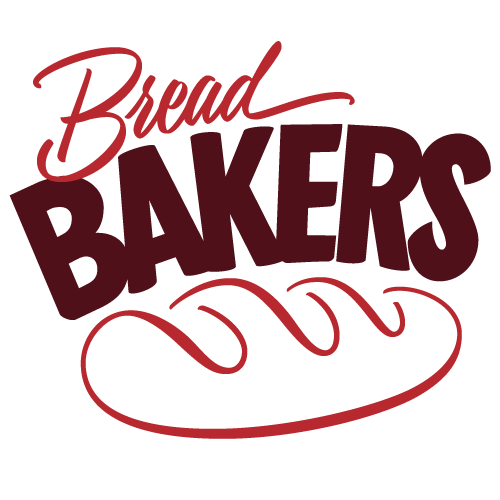 One of the best things about moving to a new place is learning about the local food culture and discovering new ingredients. New to me five years ago were barberries, a featured staple in our neighbor-across-the-gulf, Iran. Barberries are little sweet and sour jewels that add a lovely sharp flavor to many dishes in the Middle East. 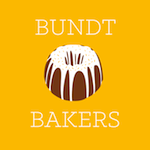 The population of Dubai is such a wonderful mix of nationalities and cultures that just about every ingredient known to man must be available here, if you just know where to look for it. 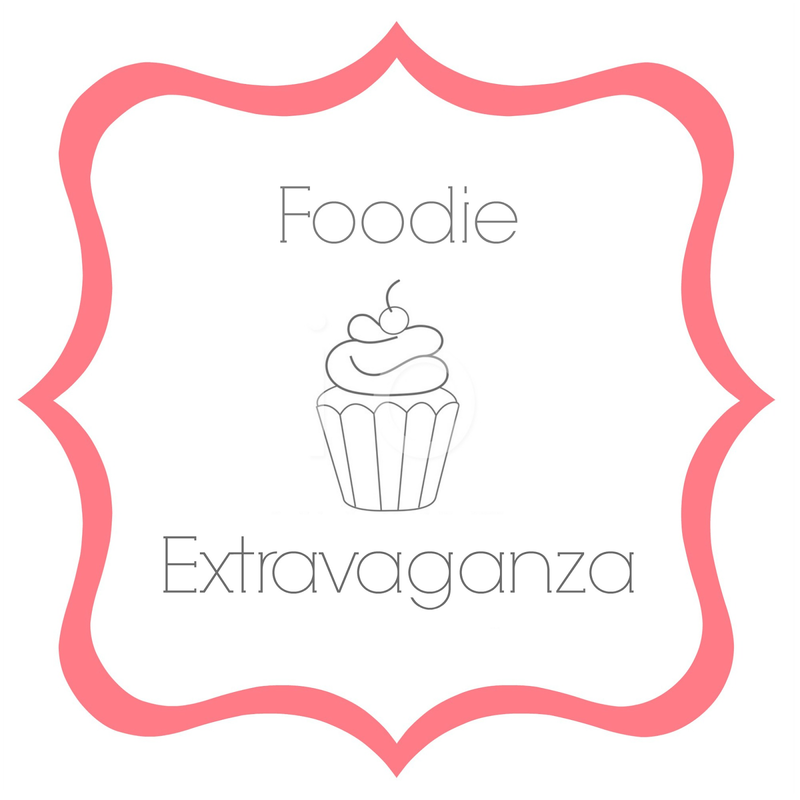 I came across barberries for the first time during a foodie tour with Frying Pan Adventures. If you are ever in Dubai and want to see how the real people eat, never mind the fancy, shiny high-rise hotel restaurants, I highly recommend booking the Frying Pan Middle Eastern Food Pilgrimage. 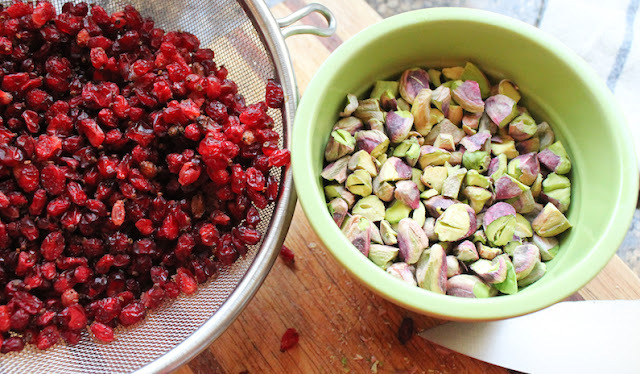 The flavor of barberries reminds me of dried cranberries so if you can’t get them, chop up some cranberries instead. Ottolenghi suggests substituting dried currants soaked in lemon juice, but I know that currants are hard to come by in the United States. If you live in Australia or the UK (or somewhere else they are available) those would be a good option as well. 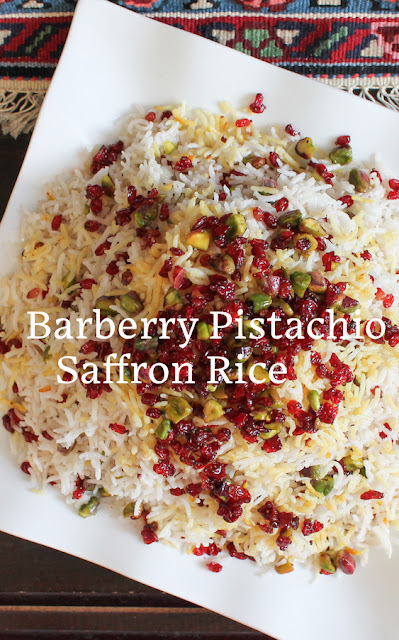 I’ve adapted this Barberry Pistachio Saffron Rice from two recipes. 1. from Ottolenghi.co.uk, which gives more explicit instructions for cooking the rice and 2. from a community member of Nigella.com which says simply, “Cook rice in a rice steamer.” I chose to use my rice cooker so those instructions follow. 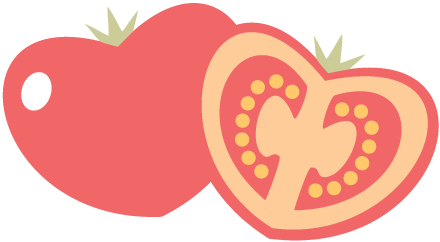 The amounts below should also work on the stovetop, in a heavy pan with a tight-fitting lid. My mom always says that the right amount of water is 1 cup for each cup of rice plus 1 cup for the pot. Or follow the instructions on your bag of rice. 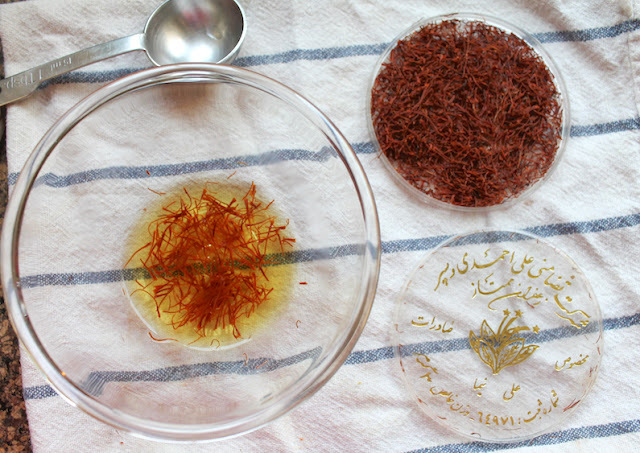 Pour 1 tablespoon of boiling water over the saffron and set it aside to steep for 30 minutes. Put the barberries in a small bowl and pour enough boiling water to cover them along with a 1/2 teaspoon of sugar. Leave for 10-15 minutes, then drain. 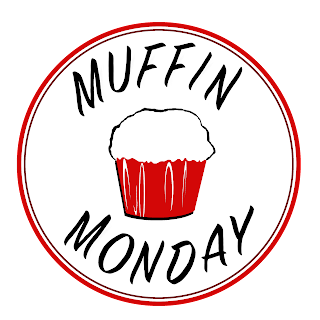 Pour 1 tablespoon of the olive oil in your rice cooker then add the rice, stirring to make sure the grains are well coated. Add the cold water and 1 teaspoon fine sea salt. Stir well. Put on the lid and set to “Cook” mode. When the rice cooker switches from cook to warm, set a timer for 10 minutes and cover the still closed pot with a couple of dry tea towels. 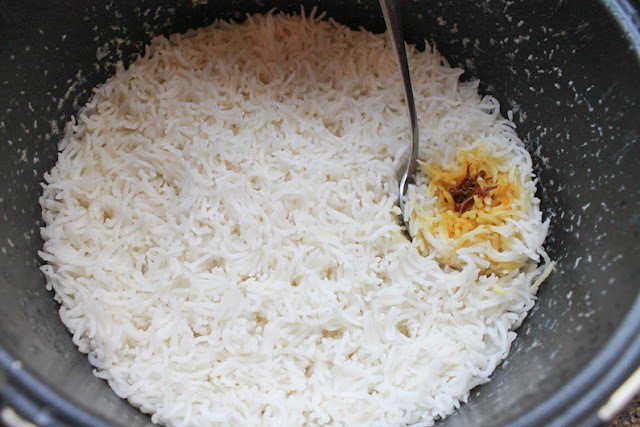 When the timer rings, open the lid and pour your soaked saffron with the golden water on one small portion of the rice. Cover again with the lid then tea towels while you prepare the rest of the dish. 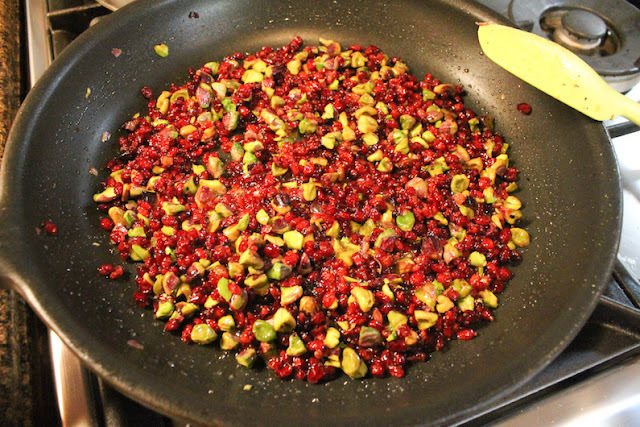 In a large saucepan, add 1 tablespoon of olive oil and lightly toast the chopped pistachios along with the drained barberries over a medium heat. Add in the salt and a few good grinds of black pepper. 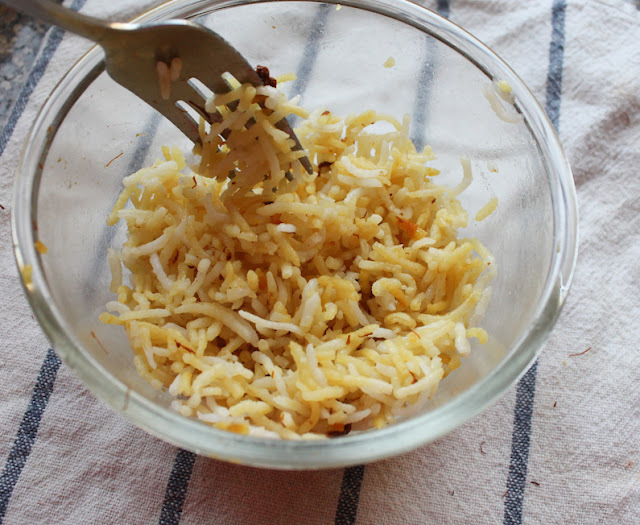 Use a spoon to remove the saffron colored section of the rice and fluff it up in a small bowl. Use a fork to fluff up the rest of the white rice. 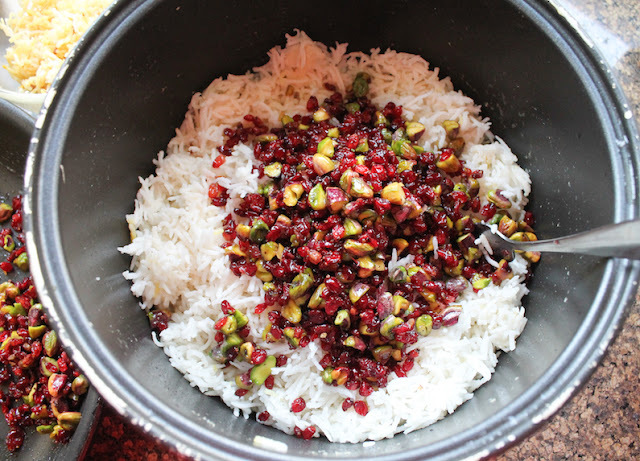 Set aside a small amount of the barberries and pistachios to decorate the top, then add the rest to the rice pot, lightly folding them in till well combined. Then fold the saffron rice in lightly as well. Spoon the rice into a serving dish then top with the reserved barberries and pistachios. Serve warm. 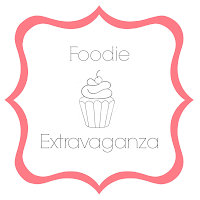 Complete your meal by making my Persian Lamb Meatballs and Egyptian Date Crescents for dessert. Barberry Pistachio Saffron Rice is my contribution to this month's Foodie Extravaganza where we are sharing recipes with nuts. Many thanks to our host is Caroline from Caroline's Cooking.